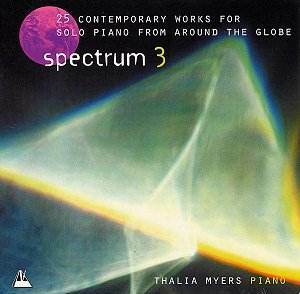 The Spectrum project began in 1995 when, disillusioned by the lack of quality contemporary piano music available for students and amateurs to play, Thalia Myers commissioned twenty British composers, each to write a short work suitable for non-professional performers whilst retaining the essential characteristics of their own compositional style. The Associated Board of the Royal Schools of Music subsequently published the works and the success of the project was such that it was repeated in Spectrum 2. It was perhaps only a matter of time therefore until the project went international although this necessitated a change of label from NMC to Metronome, the former obligated by its charitable status to British composers only. The result was the further commissioning of twenty-five composers from countries as diverse as Lebanon to Latvia and encompassing names that include the unfamiliar as well as those with an existing international reputation, amongst them Aulis Sallinen, Peter Sculthorpe and Poul Ruders. Not surprisingly, and entirely appropriately in today�s eclectic musical climate, the pieces demonstrate a wide range of compositional styles taking in minimalism, post-modernism and those with a more "maverick" approach along the way, although there is possibly a tendency to avoid the densest atonality. In this respect Ramon Lazkano�s Zortziko is possibly one of the toughest nuts, a transformation of a Basque greeting dance that eventually resonates away to silence, whilst Joyce Bee Tuan Koh�s la pierre magenta and Sohrab Uduman�s Still, Suspended are more freely dissonant than many of their bedfellows, the former an uncompromising study expressing in music the calligraphic characteristics of the letters P and M.
Of the minimalist inspired contributions I found Julia Wolfe�s Earring, pitting a simple left hand melody against persistent repeated notes in the high register of the instrument rather empty with Kevin Volan�s Wrist Rock offering much more interest in its cleverly shifting rhythmic interplay. Poul Ruder�s also provides a fleeting yet entertaining study with his portrait of Shooting Stars in which showers of notes are subjected to rhythmic displacement whilst Gerald Barry�s Root Position (more maverick than minimalist perhaps) is guaranteed to raise a smile. Another of the more amusing contributions is Lyell Cresswell�s Apteryx, Cresswell long having been resident in Scotland but returning to his native New Zealand for this stumbling, clumsy portrait of the flightless Kiwi. Of the names that are best known internationally Peter Sculthorpe gives us a recollection of the popular 30�s music often played on machines at fairgrounds visited during his youth, with Aulis Sallinen�s King Lear�s Distant War more overtly serious but particularly effective in its writing. Like the Sculthorpe, Sylvie Bodorová explores a fairground theme in her Carousel with an Arabic doll providing the inspiration for Naji Hakim�s Dumia, an attractive study in eastern scalic passages, a kind of Golliwog�s Cakewalk for the twenty-first century. Haflidi Hallgrimsson�s Drymla, (another composer now resident in Scotland) is particularly effective in its pictures of transfigured, mist shrouded Icelandic landscapes, Karen Tanaka�s delicately scented Lavender Field being memorable for very different reasons. There are, it must be said, those contributions that are not so successful and Alexandre Lunsqui�s tempo absurdo, Rodney Sharman�s The Anglo Tango and Param Vir�s White Light Chorale are amongst those that I will not rush to hear again. Overall however, the impression is of a diverse collection of interesting pieces, some of the most ear-catching coming from the less well known, younger generation of composers. I found it a shame that the piano was recorded too closely resulting in a disconcertingly "in your face" sound and at forty minutes the disc is also not the best when it comes to value for money. Without a doubt however the most important factor is that the music is likely to bring a greater number of young pianists and amateur players into contact with the contemporary repertoire and that in itself makes the project hugely worthwhile.